Ross specializes in Sports Massage , Swedish Massage and Remedial Massage. Great mobile massage service, very professional and friendly attitude. Definitely will book again. Another excellent massage from Ross, many thanks. Ross is very easy to talk to, and very willing to adapt to my special needs, in deed he explicitly invites that discussion. Very professional service. B. Why did you decide to become a massage therapist? R. The primary motivation for becoming a massage therapist is because I love to help people and make them feel better. I found that after working a few office jobs that there was very little satisfaction in just joining the rat race and doing 9-5, not really doing anything to help anyone. There’s thousands of people out there who are in need of some assistance to make themselves feel better, both on a physical and emotional level and I found that ultimately, that’s the direction I wanted to take in my life professionally. Add into that the relaxed lifestyle and seeing nothing but happy faces by the end of the day and it really made it a no brainer! B. Why do you love Blys? R. I love the convenience that Blys provides. It’s easy to work, a good way of connecting clients to reliable, quality therapists and from the therapist perspective, it’s a handy way to see a few extra clients on the side of my current clinic hours. It’s a step forward in the massage industry in simplifying the massage booking process and providing convenience for the client to not have to scroll through endless google search results to find a massage therapist, who probably doesn’t have any appointments available when you want it anyway. In summary, three words: convenience, simplicity, quality. B. Have you found that massage therapy does promote wellness for your customers? R. No doubt! The direct physical effects of massage are probably the most obvious ones. These are probably what most clients think about when they book a massage. But what is often overlooked are the psychological effects and the physiological effects of a massage. Just the simple act of having a healing hand on your shoulder can do wonders for your emotional state, without even working through an hour of massage. B. What’s the best compliment you’ve ever received? R. I think anytime someone asks (or begs) you to keep going longer is about the highest compliment you can receive – don’t be afraid to ask! B. What’s your favorite spot in Sydney? Favourite cafe: Gertrude & Alice, Bondi Beach – a cafe with friendly staff that also doubles up as a book store, selling an array of new and second hand books. You can lose yourself for hours and find yourself some bargains in this cosy little space. Favourite swimming: The Needles, Engadine – A swimming hole where I spent a lot of my childhood. A 10 minute walk down a fire trail and you arrive at a pristine swimming hole, with large rocks to sun bake on, a rope swing and despite it’s proximity to suburbia, you seem like you’re miles away in this little slice of paradise. Honorable mention to Jibbon Beach and Nielsen Park too. Favourite Walk: If you’re looking for the best way to see Sydney, you really can’t go past the Hermitage Foreshore Walk. You can start from as far back as South Head or if you’re in a rush, then from Nielsen Park. Either way, you’re going to get the best uninterrupted views of the Sydney skyline that the city has to offer. 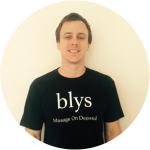 Ready to relax with a Blys Therapist at home? Easy online booking. At your door today.